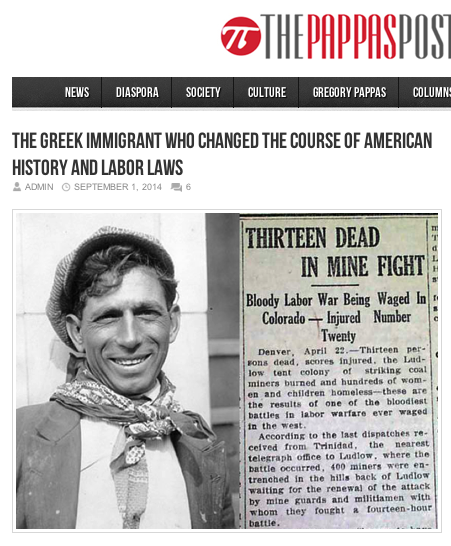 As we celebrate Labor Day today across the United States, we should take a moment and remember the legacy of a Greek immigrant from Crete named Louis Tikas whose heroism and activism a century ago set the stage for the reforms to American labor laws and workers’ rights. Not much has been written about the story, with the exception of an important book called Buried Unsung. Tikas was born in Crete and emigrated to the United States with thousands of his fellow islanders and countrymen. Official and unofficial documents point to an astonishing 40,000 Greeks working in Rocky Mountain mines, mills and railroads before World War I. To mark the centennial of the event this year, Greek filmmakers Lamprini Thoma and Nickos Ventouras created a documentary called “Palikari” which charts the story of the strike and Tikas’s murder, as it survives in oral and family traditions, as well as in official history. They interviewed historians and artists, some of them direct descendants of those striking miners.